Who doesn’t love fudge?!? It’s rich and decadent. Recently I found a recipe for an easy fudge that I decided I needed to try. It is so easy to make and tastes yummy! The best thing is that it only requires 3 ingredients! Yes I said it right, I only needed three ingredients. Not bad for a delicious piece of fudge. Place the chocolate chips and condensed milk in a microwavable safe bowl. Microwave on 70% power for 1.5 minutes. Stir. Continue microwave on 70% power for another 1.5 minutes. Stir. If the chocolate is not melted, continue microwaving on 70% power for 30 second intervals until the chocolate is melted. Once the chocolate is melted, add the vanilla and stir. 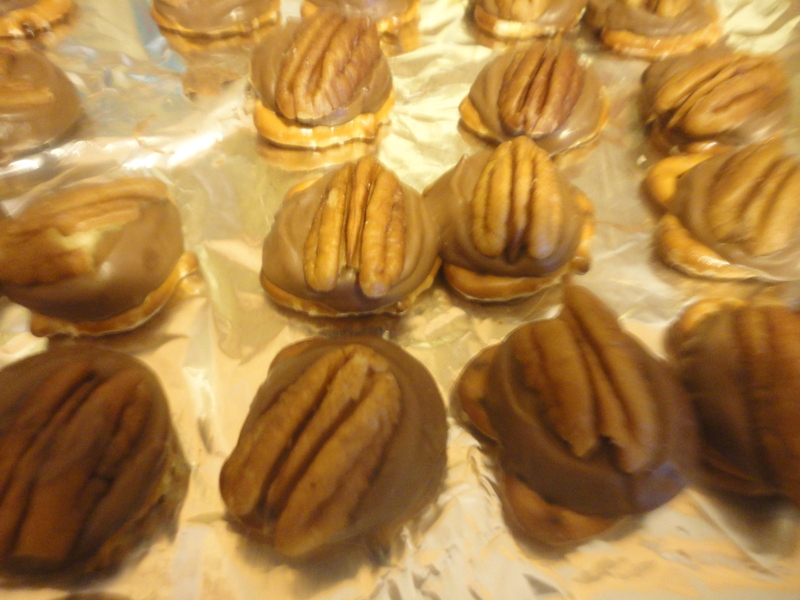 If you add pecans, this would be when they would be added. Place in the fridge until it’s hardened. Cut into pieces. Enjoy! Line a 10 x 15 inch cookie sheet with foil; spray very lightly with cooking spray. Cover cookie sheet with saltines. Boil sugar and butter for 3 minutes. Pour mixture over saltines and spread evenly. Bake at 400 degrees Fahrenheit for 5 minutes. Sprinkle with chocolate chips. Let set 1 minute, then spread melted chips with spatula. Sprinkle 3/4 chopped nuts over this and press down lightly. Cut on diagonal immediately or cool until firm, then break up; pieces can be frozen. Yield: 30 pieces. I’ve made Chex Mix like this for the past two years. It is super easy this way. In large microwavable bowl, mix cereals, nuts, pretzels and bagel chips; set aside. In small microwavable bowl, microwave butter uncovered on High about 40 seconds or until melted. If you don’t want to make it in the microwave, you can use the oven directions instead. Cream butter, sugar, and salt until fluffy. Add flour and vanilla, mix well, scraping down sides as needed. Add nuts and mix until well incorporated. Shape into one inch balls and place on ungreased baking sheet. Bake at 325 for twenty minutes, but don’t let them brown. Cool cookies. 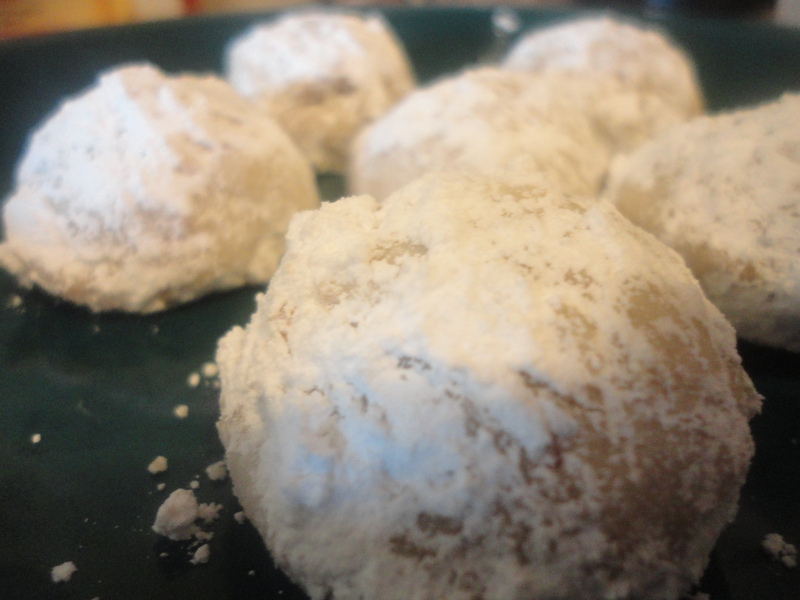 When cooled, roll in powdered sugar. I can’t believe the year is almost over. Before we know it, it will be Christmas and then we will be ringing in 2011! For more great meal plans, visit Mommy’s Kitchen.